This is such a touching story of love. We all need to be loved and to love and are blessed through those experiences during our short journey on this earth. 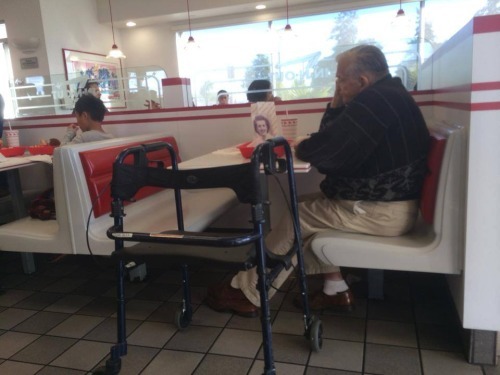 Seeing someone eating alone at a fast-food restaurant isn’t necessarily an unusual sight, but what one woman snapped a picture of at an In-and-Out Burger has been shared more than 7,000 times within the past week. What got Madina Bashizadah’s attention was not the older man sitting alone or the walker beside the table, but the photograph propped up toward him as he ate his hamburger. The photo featured his late wife. “Oh my god I just died!!! He has a picture of his wife with him as he eats!” Bashizadah wrote on Twitter. A similar photo of the same scene even made it onto an Imgur post with more details about the couple’s story. We found out that she was his sweetheart, his wife who passed away 5 years ago. They met at 17 but the war had kept them apart. He had searched for her for 10 years and one day as he was telling his barber the story, the barber calls his daughter in and it ends up being her. They were married instantly and it lasted for 55 years until she passed. He takes her photo everywhere. On one side of the laminated photo it’s him and her sitting on a couch together and on the back it has a photo of him and her side by side when they were young. Goes to show you true love does exist. Take time to love and be loved as the time is often short. This entry was posted in Uncategorized and tagged Huffington Post, joy, love, mourning, sharing the story, The Blaze, true love, true love does exist. Bookmark the permalink. Just an awesome testament to love! !